Can Green Tea Cause Insomnia? Insomnia is when you’re unable to sleep or to sleep satisfactorily. About 50 percent of U.S. adults consistently suffer from some kind of sleep-related problems where insomnia is the most common. It occurs due to an underlying sleep disorder or by a set of circumstances, such as a change in schedule or a stressful event at work. Symptoms of insomnia may include difficulties in falling or staying asleep at night, waking many times during the night, waking too early in the morning, fatigue and sleepiness. You may experience insomnia if you consume excessive amounts of green tea, especially at night. 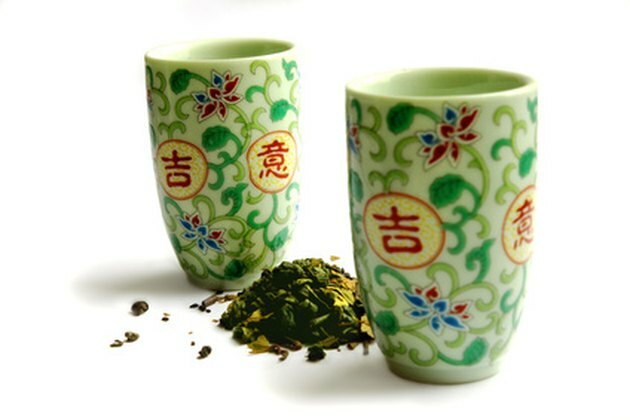 Green tea is a common beverage consumed in many Asian countries. It is made from the fresh leaves of the Camellia sinensis plant -- a hardy shrub with evergreen leaves that belongs to the plant family Theaceae. Camellia sinensis is originally from the mainland of South and Southeast Asia and is very extensively cultivated in that region. Hundreds of millions of people drink green tea around the world to promote health and satisfy thirst. The leaves of Camellia sinensis are rich in biologically active molecules, especially antioxidant compounds, called polyphenols. Epigallocatechin gallate (EGCG) is the most powerful polyphenol found in green tea, which is thought to be responsible for most of the healthful properties linked to green tea. Green tea also contains caffeine, flavonoids, volatile oils, alkaloids, polysaccharides, vitamins and minerals. Drinking too much green tea may lead to insomnia due to the caffeine in the tea. Caffeine has a central nervous system stimulating effect, which may interfere with sleep, the University of Washington notes. So, people who are hypersensitive to caffeine must avoid consuming large amounts of green tea, especially at night. Pregnant and lactating women also must limit their green tea intake because it may pass into breast milk, which may cause sleep deprivation in nursing infants. In general, a regular intake of 10 cups of green tea is necessary to obtain noticeable benefits from green tea ingestion. However, nutrition and herbal experts differ in opinion about the exact doses. Caffeine-free products are available and recommended to minimize the adverse effects associated with green tea caffeine, such as restlessness and insomnia.